We’ve somehow made it to 20 weeks with the baby. The pregnancy dragged on foreverrr (maybe because he came a week late), and now that he’s here, time is flying by. 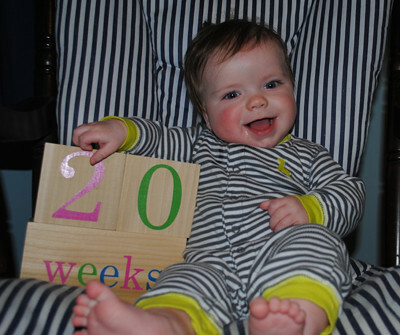 This week, the baby has decided to try to take on a new role as an escape artist. He likes to lift his top half out of the swing, and I’ve found him almost sideways in the seat of the swing. He’s also taken notice of the buckle on the swing. I’m waiting for the day that he figures out how to unlatch it and just hop on out of the seat. When he’s in the floor, it is no longer uncommon to find him on the opposite end of the blanket he had been placed on – and turned the opposite direction. He’s good at scooting. 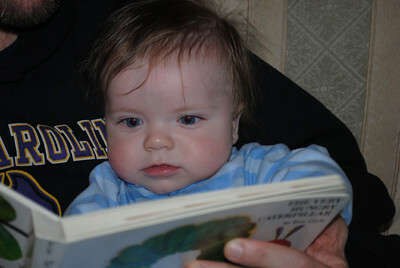 And new this week…he’s starting to like being read to. He really enjoys eating books, but he also tolerates us reading to him now, and only occasionally yells over us. We try to read several stories/books to him each day. And the squeaking in the video? That’s the husband screeching “Smile!” We generally don’t talk ‘baby talk’ to the baby, but that little bit is acceptable.